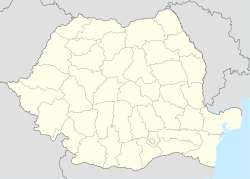 Bran (German: Törzburg; Hungarian: Törcsvár) is a commune in Brașov County, Romania. It lies at 30 km from the city of Brașov and is composed of five villages: Bran, Poarta (Hungarian: Porta), Predeluț (Kispredeál), Șimon (Simon) and Sohodol (Szohodol). The medieval Bran Castle, which was once besieged by Vlad the Impaler, is a popular tourist destination, partly because it resembles the home of Dracula in Bram Stoker's novel. After the Kingdom of Hungary was defeated by the Ottoman Empire, Bran became part of the Principality of Transylvania during the 16th century, and eventually passed to the Habsburg Monarchy of Austria. The commune became part of the Austrian Empire in 1804 and the Austro-Hungarian Empire in 1867. It was added to the Kingdom of Romania following World War I.
Bran Castle is one of Romania's most popular visitor sites, made famous in modern times when Queen Marie restored it after receiving it from the residents of Brașov County in the 1920s. The castle is open to tourists, who can view the inside alone or as part of a guided tour. Outside the castle are examples of traditional Romanian farm houses and peasant homes.